Given that Disney Theatrical has a Frozen musical in the works AND Walt Disney Animation Studios is already developing Frozen 2 AND a Frozen ride will be opening at Epcot early next year, it's easy nowadays to forget that there was actually a CG Disney Princess which preceded Anna & Elsa. And that's Rapunzel of Tangled fame. 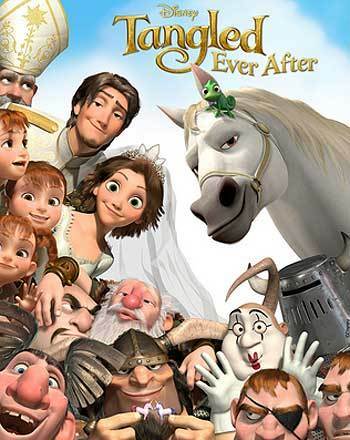 In fact, to hear some Disney insiders talk, if Tangled hadn't been as successful as it was when this WDAS production hit theaters back in November of 2010 (This Nathan Greno / Bryon Howard film would eventually earn $200 million domestically and more than $593 million worldwide), there never would have been a Frozen. Well, while the $1.27 billion worth of tickets that Anna and Elsa sold has long since thrown Rapunzel's bountiful box office success into eclipse, Disney execs haven't forgotten about this long-haired heroine. In fact, over the past five years, they've done everything that that they could to keep Tangled and its characters out there in the spotlight. These efforts included Tangled Ever After (i.e., the 2012 animated short that detailed what happened at Rapunzel and Flynn Rider's wedding), that 16-foot-high stone sculpture which pays tribute to Rapunzel's tower which was erected in Disneyland Park's new Fantasy Faire area back in 2013, not to mention that 29-foot-long Tangled-themed unit which began rolling through WDW's Magic Kingdom back in 2014 as part of that theme park's new "Festival of Fantasy" parade. Virtually every arm of The Walt Disney Company has been involved in this keep-Rapunzel-front-of-mind effort. Take -- for example -- how Disney Interactive made this frying-pan-wielding female a playable character in their Disney Infinity game. Or how -- starting this November -- the Disney Cruise Line will begin presenting "Tangled: The Musical" aboard the Disney Magic. But, of all of the arms of the Mouse House, it's the Disney Channel that's decided it most wants to be in the Rapunzel business. 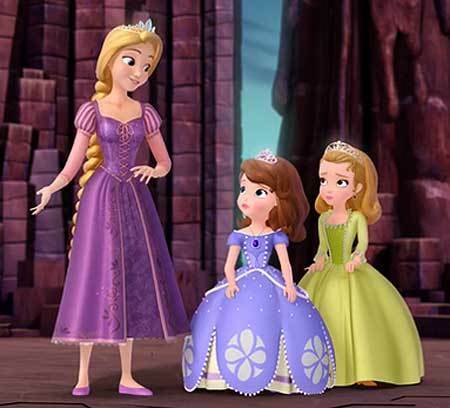 Which is why -- on the heels of the great ratings that Sofia the First: The Curse of Princess Ivy got last November, (this Disney Junior special movie event was the No. 1 primetime telecast for preschoolers last year, pulling in 4.7 million viewers) -- they've decided to put a Tangled animated series into production. 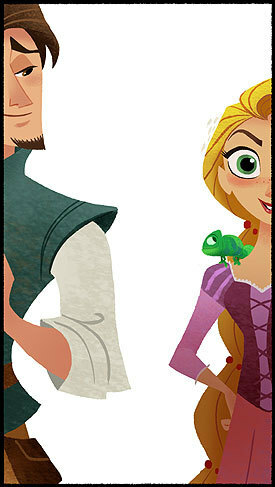 Of course, understanding that Mandy Moore and Zachary Levi's quirky vocal performances as Rapunzel and Flynn Rider were one of the main reasons that audiences embraced Tangled in the first place, Disney Television Animation has persuaded these two popular performers to come reprise their roles on this new animated series. Likewise -- given that the songs that Alan Menken and Glenn Slater crafted for this Academy Award-nominated production also played a huge part in Tangled's continued success -- the Disney Channel knew that these two had to be part of this project as well. Which is why Menken and Slater have begun writing new songs for this eagerly anticipated series (which will begin airing on Disney Channels worldwide in 2017). Mind you, the Disney Channel made sure that Menken, Moore, Levi and Slater were being backed up by top talent as they began working on this new animated series. Which is why Disney Television Animation tapped Chris Sonnenberg (who's probably best known for his work on Disney's Enchanted) and Shane Prigmore (who helped shepherd last year's surprise smash, The Lego Movie, into theaters) to be the co-executive producers of this TV program. As part of today's official announcement of Disney Television Animation's Tangled series, Gary Marsh -- President and Chief Creative Officer of Disney Channels Worldwide -- was quick to praise the talented team that has come together to make this new TV show possible. "The genius of the original movie was its seamless blending of cinematic adventure, character-driven comedy and touching emotion," Marsh explained. And we are fortunate to have several of the creative talent from that movie on board with this new production. With the addition of Chris and Shane as Executive Producers, we have the perfect team in place to create a series worthy of the original film. As for the show itself, the creative team behind Disney Television Animation's Tangled series (which includes celebrated artist Claire Keane, the daughter of Disney Legend Glen Keane who was animation supervisor on the original Tangled movie) has decided to set this new TV show in that period which falls between the end of the 2010 full-length animated feature and the opening of Disney's 2012 animated short, Tangled Ever After. 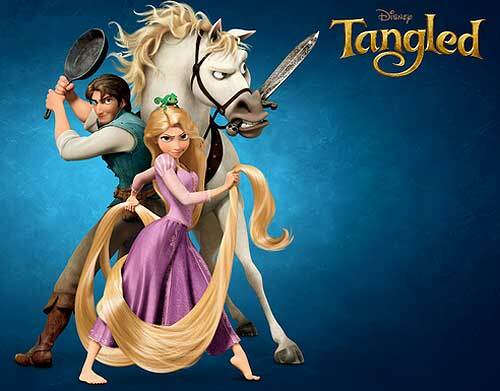 To be specific, Tangled the animated series unfolds as Rapunzel acquaints herself with her parents, her kingdom and the people of Corona. Her irrepressible spirit and natural curiosity about the world drives Rapunzel to the realization that there is so much more she needs to learn before she can truly accept her royal destiny. So Rapunzel boldly puts her crown and impending marriage on hold to seek out epic adventures. Much to the dismay of the King who -- after missing out on Rapunzel's youth -- must accept that his daughter is now an independent young woman. Accompanying Rapunzel on her journey will be Eugene (a.k.a. her fiancé Flynn Rider); her plucky chameleon sidekick, Pascal, the no-nonsense horse, Maximus, the Snuggly Duckling Pub Thugs and newcomer Cassandra, a tough-as-nails handmaiden who becomes Rapunzel's confidant. 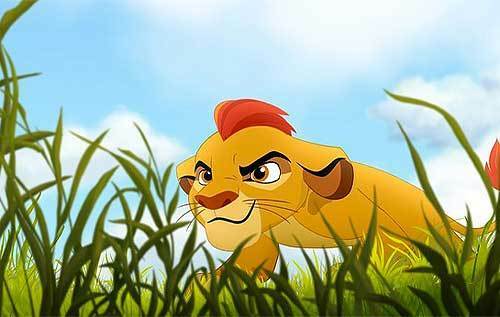 Just so you know: The Tangled animated series follows in the footsteps of 2014's "The 7D" (which brought a radically reimagined Seven Dwarfs to the small screen) and 2016's "The Lion Guard" (The upcoming Disney Junior show which continues the story of The Lion King by placing Simba's son Kion in charge of protecting the Pride Lands) in that it expands the reach / extends the life of some of The Walt Disney Company's most valuable characters and franchises by reinventing them for television. And if you're a Tangled fan and 2017 is just too long to wait to for the further adventures of Rapunzel and Flynn Rider ... Well, I guess that you could make your way to the Disneyland Resort this summer. Where the characters and music from Tangled are prominently featured in all three of the new nighttime shows that debuted last month as part of the Happiest Place on Earth's Diamond Celebration (AKA Disneyland's 60th anniversary celebration).